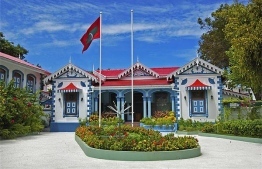 Former Chief of Staff Ahmed Mustafa at Muliaage, the official residence of the President was arrested on Saturday. According to a spokesperson for Police, Mustafa was arrested at 16:00 p.m. from Velena International Airport (VIA) for an ongoing investigation. The police also revealed that Mustafa allegedly threatened and attempted to influence witnesses by wrongfully using the power of his position. Additionally, Mustafa has been accused of accepting bribes when leasing a local island for tourism. Furthermore, he has come under investigation for having registered a Mercedes-Benz S600 gifted to the government by the kingdom of Saudi Arabia to the Maldives government in August 2018. Mustafa had released the vehicle intended for the usage of that Maldivian Head of State, from Customs after registering it under his name. Local media Mihaaru reported that Mustafa returned to Maldives on Saturday after spending a long time in Bangkok. Mustafa was chief of staff during President Abdulla Yameen Abdul Gayoom's presidency.